With the announcement from FFG that we’d finally be getting an expansion XCOM Evolution, I was inspired to pluck this one back off the shelf where it’s languished for most of the last year. Having now vigorously revisited this, I’m rather glad I didn’t write this review on my initial close encounter, time has, in this case, allowed the game and my opinions on it to mature like a fine wine. Fans of the PC game series need to park their expectations before settling down to play. This is an abstracted version of the theme, story, and style of XCOM, it’s jettisoned probably one of the most beloved parts of those games the missions these, and much of the rest are still present but in cliff notes like glimpses of its software sibling. If you’re expecting the joy of getting attached to your grunts as you name them and nurture them on those early missions before weeping like a lovesick panda when they don’t make it back, then well that’s just not here. Instead, players assume roles of the commanders and officers running the entire XCOM facility during its last ditch effort to resist the colonization of the evil alien overlords. All of the good stuff that you’ve come to love about XCOM is still here, battling the UFO’s developing tech, and the missions but in the equivalent of small little nibbles. It literally is a game of two halves. The first part is played in real time, during a frantic five minutes, the players must react to whatever the APP is throwing at them either UFO’s popping up across the globe, attacks on the base, advances in R&D. Everyone is forced into snap decisions over what tech to develop next, assigning troops to defend the base, how many interceptors to scramble against the alien menace it just keeps coming at you like a needy child in an ice cream parlor. One poor soul, the Commander is also responsible for balancing the books overspending will result in the various continents your protecting falling further into crises, so this unwitting fool must play den mother to the military industrial complex during a fire sale. This whole stage effectively does away with any chance of quarterbacking discussing any form of strategy is impossible as every few seconds the APP throws a new dilemma at the team. Adding to the mayhem is that each player has individual abilities at their disposal that only they can utilise during this timed phase or the resolution, these are ways to mitigate some of the chaos. The Central Officers role initially is little more than Sigourney Weaver’s part in Galaxy Quest (to repeat the computer), but it slowly develops as the tech is unlocked into someone who can look at the broader picture and move units and troops about to react to the mounting carnage or compound it. The second stage of the game the Resolution Phase is where you deal with the repercussions of your decisions through rolling dice. 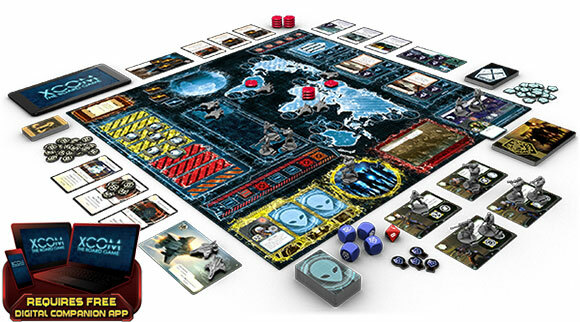 The game comes with four blue custom XCOM dice, and one Red D8 (the Alien Die) both rolled when resolving a task. Perched in one corner of the board is a threat track that slowly creeps up from 1 to 5 with each successive attempt and whenever the Alien roll is equal or below that number, then the attempt is a loss and the units involved are either destroyed or incapacitated. It adds a punishing push your luck to tasks, with the XCOM dice so weighted against success with only two of their six facings a result means that you’ll always be gambling as to whether that one more roll will pull off that miracle you need games will often have multiple standing dice rolls. Dependant on your opinions on luck, chaos, and dice is whether you’re going to be thrilled by this mechanism or appalled. It’s a brute and uncaring device for ratcheting up the pressure and tension, it’s certainly not subtle, but it works. This is the equivalent of Pandemic on steroids with a quadruple espresso it’s remorseless and at first can seem that the odds are ridiculously stacked against you. And on my first encounters with it, I would and did dismiss it as that. But now having had the luxury of letting this percolate, there is a lot to be impressed with; all the tech is well balanced to give an edge against the chaos. And it never feels gimmicky the app is integral to the design and helps to create this tension-filled first half that no amount of sand timers or stopwatches could ever have achieved. It’s not perfect the lack of manual I’m sure deemed revolutionary in a board room somewhere is a drag. Yes, the app does an excellent job of teaching that first play, but it’s a ball ache not having something physical to reference as a reminder if you just want to quickly refresh your brain as to how things play out. As I already mentioned the merciless luck dependant second half can with a run of bad rolls just feel like some sadomasochistic punishment, it is to some degree mitigated by the tech cards I mentioned, but I get that for some players it’s not enough. This is definitely one of those try before you buys and is very group dependent, but with the right gathering and the correct mindset, this can be an exhausting but thrilling experience. I finally received my copy of XCOM a few weeks ago, and so far I’ve played about 25 times. The game is wonderful. The very first thing you need to do to play XCOM: The Board Game, is to download the free app on your phone/tablet/thing-device/computer. Here’s a link. Then each player will choose their role(s). This will dictate their responsibilities during the game. Each is completely unique. Each is completely essential. Now it’s time to start. Following the directions given to you by the app, you will set up the scenario. The app will lead through setup, telling you which Invasion Plan the enemy is using, which different aliens you will encounter, where your Headquarters are located, and what starting panic is. The game itself happens in 2 phases. First is the Timed Phase–a frantic, timed, rush to prepare what you are going to do this round while UFO’s are coming into orbit and Enemies are attacking your Base. Next is the Resolution Phase. This is slower than the Timed Phase, as you aren’t on the clock. Here you will do all of your die rolling to complete the various Tasks–Researching new Technology, defeating Enemies and completing Missions, or shooting down the UFO’s filling your skies. During the Timed Phase, the App will give you instructions on what things to do–when New Technology Available, the size of your Budget, UFO sightings, Enemies in your base, when to send Soldiers on a Mission, Deploying Satellites, and so on. Every unit you place on the board costs 1 Credit, so watch your Budget! Except for the first 2 of these, the order they come in is variable, meaning that you can’t sit back and wait for your turn to do stuff–You have to be prepared. Sometimes, your intel will be obscured. You’ll be told to Deploy Interceptors before you know where the UFO’s are, or you’ll have to Assign Soldiers to Defend the Base before knowing which Enemies will attack. Nasty stuff. After that comes the Resolution Phase–14 things that always happen in the same order. First you Audit your Budget–Count up the money you spent compared with the money you had. If you have more Credits than you spent, you can use the leftovers to Recruit more Soldiers and Build more Interceptors. If you spent more Credits than you had, well… You will increase Panic in the Continent that is already the most Panicked. Then you’ll Resolve Research. For every unit Assigned (in this case, Scientists) you will roll 1 die. Each die has 2 Success markers and 4 blank spaces. If you roll enough Successes, you get the Tech card. But you also roll the Enemy die. This is just a standard d8. If you roll a 1 on this Enemy die, you lose your people. It is possible to Succeed and Fail at the same time–Maybe your Interceptor shoots down the UFO’s, but doesn’t have enough fuel to get back home. If you don’t succeed or fail, you save the successes that you got, and then you have the option to roll again–But this time you fail on a roll of a 1 or on the roll of a 2. If you still don’t succeed or fail, you can roll again–And fail on a 3 or less. You get to roll 1 XCOM die for each Scientist you assign to a research task. The maximum Threat–The chance of failing–Is 5. You will always be safe rolling a 6, 7 or 8 on the Enemy die. When you stop rolling for a Task, the Threat resets and you start the next Task. Next you do something very similar with Orbital Defense–Roll 1 die for each Satellite you have, destroying 1 UFO for each success. You can keep rolling if you haven’t killed all of the UFO’s, but you risk losing your Satellites. Each UFO remaining will increase Panic. And the same for Global Defense with your Interceptors, again increasing Panic for each UFO you didn’t destroy. The last 2 Tasks to complete are to Defend the Base and attempt to complete the Mission. These are a little bit more complicated than the first 3 types. Each Soldier has 2 Icons, 1 of which will have a gold border. Each Mission Task or Enemy also has between 1 and 3 Icons, which may or may not have gold borders. To Assign a Soldier to a Task, the Task’s Icon must match 1 of the 2 Icons on the Soldier. Like everything else, a Soldier Assigned to a Task allows you to roll 1 die. But if the Icon on the Soldier has a gold border and the Icon on the Task also has a gold border, you get to roll an extra die. Non-Enemy Tasks always require 1 Success, while Enemies will need between 1 and 3. After that you input some final information. Was the Base destroyed, did you complete a Mission, what Panic look like, and how many UFO’s are in Orbit. Then you begin the next round. After completing a certain number or rounds, the App will tell you that you can attempt the Final Mission, which is more difficult than regular Missions. If you complete the Final Mission, and your Base isn’t destroyed and 2 Continents aren’t in total Panic, then you win. Big picture on the front. Smaller picture of a game in progress on the back with a bit of writing describing the theme and some of how the game works. Exactly what I’m looking for. Each player has a side of the board where all of their things are, which is a really nice idea. In practice, it isn’t quite so convenient. Most tables are too big to comfortably seat 1 person on each side. This can be fixed by turning the board 45° so that it makes a diamond shape on the table. On the other had, the artwork is very nice, and the spaces where things go are plenty large enough to fit everything. Fantasy Flight is renowned for their miniature quality, and XCOM is no exception. You can see the laces on all of the Solder’s boots and the hair on their heads. The UFO’s are slightly lower quality, but that’s so that you can stack them up easily. Most cardboard tokens are rather mediocre. They don’t fall apart, but they don’t feel nice either. That isn’t the case here. The tokens are solid and thick and feel nice to touch. The rulebook for XCOM is all in the App, and is just a list of linked sections that explain things like Global Defense or Panic. Many people of complained that this makes it more difficult for them to learn the rules, but I disagree. Most sections have nice diagrams that explain things, and all of them have links to related sections. You can access the rulebook at any time during the game by clicking on the action you want to know more about, and don’t have to go flipping through trying to find what you want. I really like it. $41 is a very good price for the amount of stuff you get. Not a really, really great price, but a good one. 4 Difficulty levels. 5 Invasion Plans. 6 possible starting Continents. 9 types of Enemies. This won’t always be a different game, but there are lots of things to make it change. Never, in ay game, have I seen such completely different roles. Someone fights Enemies, someone else does Research while another decides which Crises is more important to avoid. It’s fantastic. So far I’ve only played on Easy and Normal (and 1 game on Hard, which we lost terribly). The range of difficulty is wonderful, and it would be very easy to change things slightly more to fit your exact skill level–start with 11 Credits on Emergency Funding instead of 10, start with 1 UFO in Orbit, choose 2 of the Continent bonuses instead of 1, only use 6 Scientists instead of 8… This is so customizable it’s insane. You won’t ever feel that the game is too easy or too hard. There isn’t a whole lot of this in XCOM. You are primarily reacting to the aliens and trying to stop them from taking over the world. You don’t have the luxury of planning ahead. The dice can be really mean to you sometimes, which can ruin your game. That’s part of the tension. But, if you have a solid strategy and plan for some poor rolls, you’ll still be able to manage. Deciding whether to get a new Soldier or a new Interceptor, which Crisis is worse, which Technology to get, and whether to keep pushing the Mission or wait for another round… XCOM is rich with decision-making that is never perfectly clear. XCOM isn’t really easy to teach. The rolling mechanic doesn’t make much sense when you try to explain it to people, and it’s difficult to grasp everything that’s going on. The best way to teach this game is to dive in and explain things as they come up. There is some of this, but only 10-30 seconds worth at a time. There is more of this. Lots of opportunity to talk about what your team did wrong and what they did right. There is something unique about each player having a completely different role, but all of those roles helping each other out. The Central Officer and Commander will receive Tech that are only useful for the Squad Leader–who, in turn, gets Tech to help the Chief Scientist–Who is the one giving out all of this in the first place. It really builds a sense of teamwork and camaraderie that I haven’t found anywhere else. Asia is falling! That Sectoid just ripped my Assault Soldier apart! We don’t have enough money do get rid of these UFO’s, and even if we did have the money we don’t have time! ****! ****! ****! XCOM simulates an alien invasion where we are badly outmatched. You feel the terror when the people of the world start to Panic–and the pain as they stop funding you because they need the money elsewhere. You feel so accomplished when you finally get those Plasma Rifles and use them to bust some aliens. The theme here is wonderful and fantastic and amazing. Most possible situations are covered. This is a good rulebook. Like I said, these are in most of the sections of the rules. The FAQ is actually useful. It isn’t complete, but it covers most of the questions that the rulebook itself doesn’t answer. Despite each role being so different, they are all essential, and they all feel pretty essential. The only one lacking is the Central Officer, who kind of feels like all they’re doing is telling everyone else when to do things. This last element is a little bit arbitrary. It is my true rating of the game, regardless of averages (I tend to enjoy most of the games I have played). This is just a simple scale to 10 11, with no averages or equations or careful logic. Just about how much I like playing the game. That is XCOM: The Board Game. It isn’t the greatest game I have ever played, but it has so much potential. And knowing Fantasy Flight, that potential will be realized. The game is easy to learn, very FUN with 4 players.. but once you’ve played it a few times it looses it’s replayabilty..
As a whole it simply doesn’t have enough theme in it, and it feels like a co-op chess game, or some other abstract game with theme attached to it. Although the time restraints is very nice, the game feels too barren of stuff to do. Even unique dice or unique units added through research would have done it for me. Very recommended to play – but not to own. 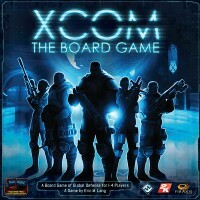 Add a Review for "XCOM: The Board Game"